All these three hats come from the same ball of Bendigo alpaca. The difference in colours is due to the light. I possibly have enough left on the ball to make another small sized hat, but am now knitting yellow for a bit of a change. 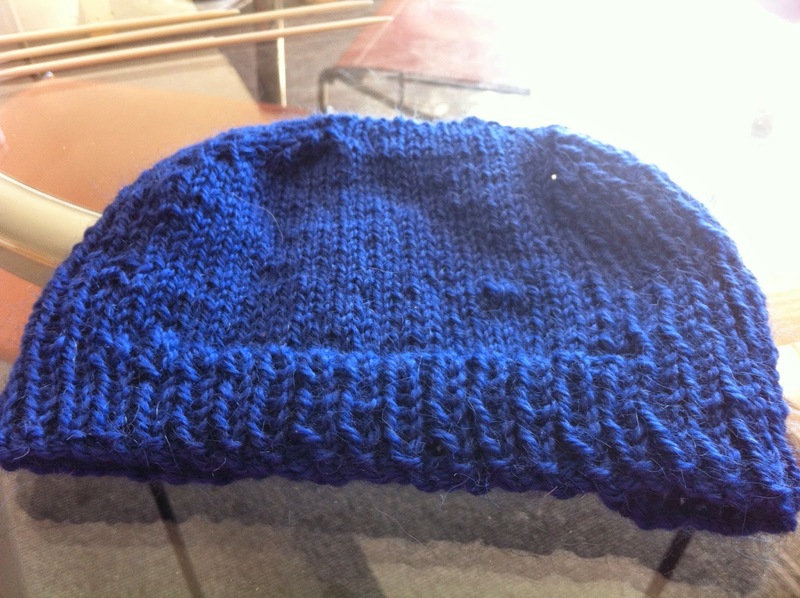 My son asked for some smaller hats to be made as well as those with around 80 stitches in a thicker yarn. One little mite whom they knew at the hospital was diagnosed with leukaemia at three months old. She didn't quite make her third birthday, although an early party was held for her. The bottom hat is a downsized version of Odessa which I originally downloaded way back in 2003. I've made several of this pattern over the years, easy, attractive, quick. I've even done one with beads but don't think they are suitable for a chemo hat for a sensitive scalp. The top hat is slightly flatter across the decreases than the second. Miss M starts the last of the intensive chemo in this original blast of treatment in a few days. It will probably trigger another bout of diabetes. Hopefully, that will go in a couple of months when this cycle ends. She's pretty brave and pricks her fingers for blood sugar level tests every couple of hours. Not up to doing the injections herself and I hope it disappears before she is old enough for that. Chickenpox is still doing the rounds at her school, so she has not been attending there. Her resistance is very low to pretty well anything, and even a cold is a major illness for her. I don't mind making hats in different sizes. It's a bit of variety in the knitting. Heads come in different shapes and sizes and what fits one, won't fit another. The current knit has eighty stitches and blocks of alternating purl and plan stitches. I'd like to do some lace patterns and think they would probably be OK. Son is not so sure, as the chemo makes the skin very sensitive to sunlight and the scalp can burn easily, even in winter. It's finally turning to winter. The nights are getting decidedly chilly and the other morning it was only 4° C here, which is cold for close to the sea in Sydney. I have seen it colder but not often. Today is beautiful, very sunny although the morning was cold. We've had some needed rain as well. Last week I bought a large rug online for a very reasonable price. It is to go in the lounge room and is 2.5 by 3.3 metres. It will cover quite a bit of my plain grey carpet which was the original installation. Today is Wednesday. Last Friday I had an email from the courier company that it would be her yesterday. No rug, no email, no phone call, no message. Not happy Jan. That is quite a few days to arrange the delivery and the courier firm had it in their possession on the Friday. I will give it till later this afternoon before I make a call. I hate chasing stuff up. This company is not the one run by Auspost which has a very bad reputation, but is not much above it. I am a grammar and spelling pedant. I make typos, but try to find them, but spelling mistakes are another thing altogether. It seems that there is very little proofreading done these days. I guess many of the sub-editors on the Sydney Morning Herald have been pensioned off or just sacked. The grammar and spelling there gets worse, almost every week. My son sent this picture from his local Central Coast train station which is being upgraded. There are many notices around, most warning of danger of glass, equipment etc. The Transport Minister is known here as Our Glad. She is fussy about such things as train guards wearing trousers and not shorts. She does not like knobbly knees. Trains running on time or cancellations do not seem to be as important to her. However, any way one looks at this photo, something is wrong. No proofing apparently. I am surprised that "maintenance" has been done correctly. I really like that Odessa hat! My WM who, as you know, has a managerial position with NSW Trainlink, just raised his eyebrows and said, "Hmm, yep"!